Hotel : La Quinta Suite or similar. We’ll head to the Bay Area in the morning. On your way to Monterey, you can enjoy Great coastal views as well as a wealthy environment of Golf Courses and nature. After arriving in Bay area, we will visit Cannery Row, Old Fisherman’s Wharf and Monterey Bay Aquarium(self-pay admission). Cannery Row, known as a famous novel by American author John Steinbeck, is now a top tourist destination which is filled with shops and restaurants. The Monterey Aquarium was founded in 1984 by David Packard. With more than 35,000 creatures representing over 550 species in nearly 200 exhibits filling 34 major galleries, this world top 10 Aquarium is your window to marine life. We will stay overnight in San Jose. This morning’s city tour consists of visits to famous attractions such as the Golden Gate Bridge, Bay Bridge, China Town and Fisherman’s Wharf. In the afternoon we will pass by Sacramento and reach Lake Tahoe, stay Montbleu Resort Casino & Spa. Hotel : Montbleu Resort Casino & Spa or similar. Morning departure to Lake Tahoe to enjoy the beautiful lake and mountain sceneries, the crystal clear water, and the peaceful forest glades. (Optional tour: Tahoe Bay Cruise) In the evening we will reach MERCED. In the morning, head south to Yosemite National Park through miles of vineyards, orchards, and fertile farmland of California. 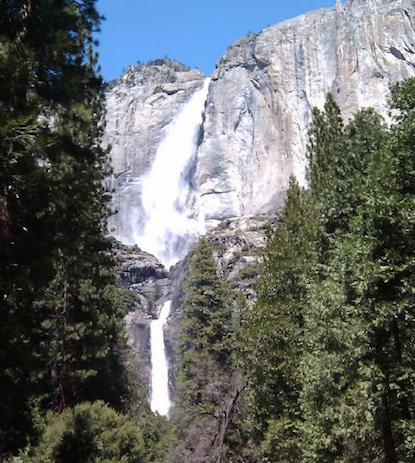 Enter Yosemite National Park to view the highest waterfall in California—Yosemite Falls, El Capitan Rock, and Tunnel View. Return to Los Angeles in the evening then transfer you to LAX airport (Please Book the Departure Flight after 9:30PM). ※ Monterey Bay Aquarium, Bay cruise & Lake Tahoe cruise.